5' X 3' SCAFFOLD END FRAMES TO BE USED WITH 7' X BRACES, PLANKS, WHEELS, SAFETY RAILING AND OTHER ACCESSORIES TO BUILD WORK TOWERS OF VARIOUS HEIGHTS. Biljax #6 tube 1 5/8" lock spacing 27-3/4" J lock with wing nuts or C & F locks used with holed braces. 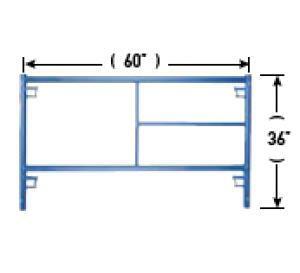 * Please call us for any questions on our scaffold frame 5 foot x3 foot rentals in Portland OR, Gresham OR, Milwaukee OR, and surrounding metro area.